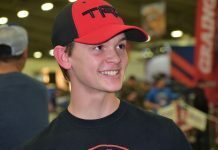 TULSA, Okla. — Going into Saturday night’s Lucas Oil Chili Bowl Nationals finale, Logan Seavey was leading an army of 23 drivers looking to dethrone Christopher Bell at Tulsa Expo Raceway. 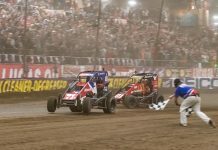 However, neither Seavey nor anyone else in the field could prevent Bell from achieving a Chili Bowl hat trick, as Oklahoma’s favorite son raced to his third straight victory in the midget classic with a thrilling, last-lap pass that will go down in history as one of the most spectacular Chili Bowl finishes ever. Bell chased down teammate and friendly rival Kyle Larson from nearly a second back over the final two laps of the 55-lap feature, charging to Larson’s inside when the Monster Energy NASCAR Cup Series star missed the bottom entering turn one on the final lap. Coming off turn two, Bell got enough traction to surge ahead and clear Larson down the backstretch, leaving Larson no choice but to try one last-ditch maneuver to retake the lead in the final corners. Larson tried to get underneath Bell in the third turn and the two banged wheels, but Bell was able to hang on to his car and bring the No. 71w iRacing.com Bullet/Toyota back to the start/finish line in front. Bell took the checkered flag in front by .350 seconds to lay claim to his third Golden Driller trophy, then flipped his car while doing victory donuts. In victory lane, the Norman, Okla., native was nearly at a loss for words as he soaked in the moment and reveled in yet another hometown triumph. “Never in my wildest dreams did I think I would be able to win the Chili Bowl at all, but to do it three straight times is just unbelievable,” said Bell. “I don’t even care about three straight, though. What about that race? I don’t think I’ve ever really been a part of a last-lap race like that, so I’m just glad that thing came out like that in the end, because that was so much fun. For the second half of the week, Bell felt like he didn’t have a chance at the victory. He won his preliminary night feature, but was hard on himself afterward and didn’t feel like he drove a strong race. Saturday night, there was no such frustration, as Bell drove a perfect final stint en route to victory. Seavey started on the pole after winning the pole shuffle earlier in the day, jumping out to the early lead after three failed attempts to get the race started and pacing the first 20 laps before company arrived to challenge. That company came in the form of Larson, who took his No. 01 McDonald’s entry around Seavey in traffic on the 21st round to assume command, looking every bit like a driver who could score the win. 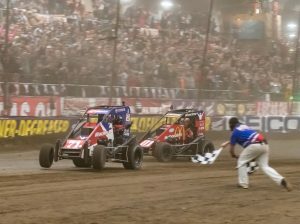 As Larson was taking the lead from Seavey, Bell was fighting back past Justin Grant to retake third, quickly setting his sights on Seavey for second.